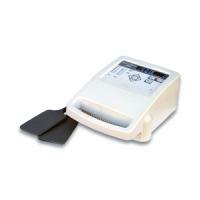 Weighing only fifteen pounds the basic Auto*Therm 390 can be easily carried between treatment rooms when the soft-rubber capacitive pads are being used. Only Mettler Electronics offers you this kind of versatility in a shortwave diathermy. Standard unit comes with softrubber electrodes and accessories. Choose to do diathermy the way you want in your practice. With either continuous or pulsed modes, you can provide the gentle warming effects of this modality to your patients. You can also choose from two different modes of application—deep penetration with inductive coil diathermy or shallower penetration with capacitive electrodes. Warranty: 2 years (1 year on applicators & accessories). ETL and C-ETL Listed: Model ME 390 (9801427). Classification: Protective Class I Equipment, Type BF Equipment. Dimensions: 7" x 14" x 16.5". Continuous mode: 100 W Average Power. Pulsed Mode: 200 W Peak Power. Pulse frequency: 10 Hz, 20Hz, 50Hz, 100Hz, 400Hz. Pulse duration range: 65 μs, 100 μs, 200 μs, 300 μs and 400 μs. Operating Temperature: +50°F to +104°F (+10°C to +40°C). Humidity: Operating, 30% to 75% Relative Humidity at 104°F (40°C). Nonoperating, 5 to 95% Relative Humidity, non-condensing. Storage Temperature: -40°F to 167°F (-40°C to 75°C). Storage Humidity: Storage, 30% to 90% Relative Humidity at 104°F (40° C), No condensing. Standard Accessories: 2 - 12 x 18 cm soft-rubber plate applicators with flexible cables, 6 felt spacers, 2 cloth covers, 2 - 48 inch elastic, Velcro® receptive straps. Shortwave Diathermy & Accessories can be found in our extensive online collection of products from globally recognized and trusted brands, including Mettler Electronics. An excellent option to consider is the Mettler Auto*Therm 390 Shortwave Diathermy with Capacitive Applicators.